Trump seeks to cut US aid to Colombia in half, but will congress approve? US President Donald Trump’s proposes to cut aid to Colombia almost in half, but whether this year’s proposals will not be overturned by Congress remains to be seen. The aid cut couldn’t come at a worse time for the US’ staunchest ally in South America; Colombia is struggling to execute a peace deal with Marxist FARC rebels and curb record-breaking cocaine production. The country additionally requested aid from international partners to deal with mass migration from neighboring country Venezuela. Notwithstanding, the White House proposed to cut aid from $180 million to $100 million to funds earmarked “to implement sustainable peace” in “the most affected zones” by Colombia’s drug-fueled armed conflict. “This budget proposal is a stark and shattering look at the Trump administration’s priorities for Latin America,” said Matt Clausen of think tank Washington Office on Latin America (WOLA). The Trump administration also seeks a $143 million cut for the International Narcotics Control and Law Enforcement program to reach a to $390 million budget. Approximately $125 million of this budget would be allocated to Colombia’s fight against cocaine production and trafficking. WOLA criticized the Trump administration’s diplomatic message as “toxic” for pressuring Colombia to improve results of counter-narcotics efforts while offering less funds to achieve this. “The White House budget proposal would squander a historic opportunity to help Colombia avoid a resurgence of criminal violence,” WOLA said. According to crime website Insight Crime, “large cuts in aid could prove detrimental to efforts aimed at improving security conditions in … crime-wracked countries” like Colombia. Illegal armed groups like AGC and ELN control much of the South American country’s countryside with profits from drug trafficking and illegal gold mining. The US is the largest export market for both commodities and has traditionally been Colombia’s main partner in the fight against illegal armed groups and their drug trafficking activities. Colombia’s illegal armed groups are violently opposing the peace process, and in particular efforts to curb the cultivation of coca, the base ingredient for cocaine. More than 20 community leaders who promoted the removal of coca through a crop substitution program have been killed in a wave of violence that has cost the lives of more than 200 social leaders since beginning of the peace process that began in December 2016. Congress is unlikely to approve the aid cuts, according to analysts of both organizations. 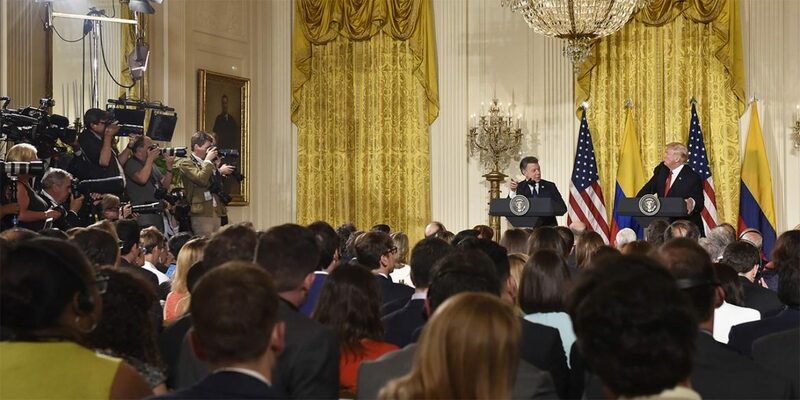 The WOLA said it “expects Congress to reverse most of the proposed FY2019 budget cuts,” meaning that US foreign policy related to Colombia will largely be defined by the legislative branch rather than the country’s TV-personality-turned-president.